Photo by Fred Ernst. View all photos of the New Technology Conference on Flickr. 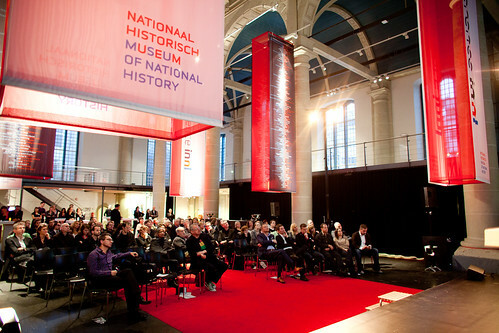 Last Wednesday the Museum of National History organised its second annual New Technology Conference. This year’s topic: innovation and oral history. Five speakers gave their shared their views on oral history from a variety of backgrounds. From each of them I learned (at least) one valuable lesson about oral history projects for museums. Shipherd Reed of the Miners’ Story Project in Arizona, USA, said he’s often redirected to others when he asks to interview someone. There’s always somebody else with a better story. This doesn’t mean, however, that the person redirecting you doesn’t have a story to tell. Everybody has a story to share. The trick is patience and building a relationship with people using existing networks and relationships. Maarten Jansen has done years of research after the oral traditions of the Mixtec people in Mexico. In his experience oral history can trigger historical awareness of interviewees. Oral history is part of the larger field of history and it’s important to understand this, as quite some oral traditions and things people tell you have their origin in traditional (and often lost) historical documents and traditions. Oral histories cannot always be understood without understanding these documents and traditions. Alex Henry of CultureShock stated that she’s often surprised how special regular people feel when a museum considers their stories important enough to record. This is a big encouragement to participate, even for people who normally don’t visit museums or cultural institutions. Through recognizing people’s stories, these people connect with museums and their collections, something they might never have done in the past. Roeland Ordelman works for the Verteld Verleden project that tries to make oral history archives accessible. Automated transcription of oral interviews to indexable and searchable documents currently has a high error margin. This can be considerably improved by using written transcripts or notes of interviews done. Jim Richardson of Sumo showed how some online oral history archives present incredible stories on their frontpage. For instance about prisoners of war. These are hard to compete with for everyday people and might limit their willingness to participate (“My story is not interesting enough.”) Presentation, especially using new media, can show how special everyday stories in fact are. (The video below is a wonderful example of this, I think). During the New Technology Conference many amazing examples of oral history projects and stories and their impact were shown. (Jim was kind enough to put his speech online.) It was an inspirational day for everybody aiming at including oral history within their toolbox for project design. The bottom-line, I think, is that there’s so much experience with oral history in a variety of sectors, that before starting out with your project, you’ll have to look around and see what others have done and learned from that. Not only in museums, but also in academia, archives and the private sector.